Mechanical keyboards are better than regular rubber-dome keyboards. It is more accurate, extremely responsive, and durable. A mechanical keyboard uses physical switches underneath keys to determine when a key is pressed. While the most common keyboards, use rubber dome membrane switches, because it is a lot cheaper to manufacture. The physical switches make mechanical keyboards much more satisfying to the touch. It improves overall typing experience and is better than rubber dome keyboards in almost every way. Mechanical keyboards are suitable for most situations. It can be used for typing, gaming, or a combination of the two. In general, mechanical keyboards are a great investment because they are long lasting, high quality keyboards. There are many more different parts and design elements inside a mechanical keyboard. This leads to more choice and more custom parts. The options can be a little overwhelming, so here is a quick list of the best mechanical keyboards. Mechanical keyboards improve typing speed and accuracy. The keys are curved and have a longer traveling distance, which decreases the chance of typing errors. A tactile or audible feedback is activated when the keys are pressed, which makes it easier to determine when a key is pressed. Less typing mistakes translates directly to an increase in typing speed. Mechanical keyboards are unique because of the high degree of customization. It has separate complete switches underneath each key. Thus, mechanical keyboards allow for easy removal and replacement of keycaps. Everything from custom keycaps to personalized laser etching can be installed to fit your own style. There are also an abundant number of mechanical switches to choose from. You are guaranteed to find a switch for nearly any situation. A little more about the different types of mechanical switches later in this article. Perhaps the most praised feature is the responsiveness it provides. Having a physical switch means each key can have a tactile feel or audible click. Most mechanical switches will make a clicking or tapping sound when they bottom out. Mechanical keys are also more likely to return to their initial positions more quickly than rubber-dome keys. This is due to having an actual physical switch compared to rubber dome keyboards, which have “virtual” switches. You can expect mechanical keyboards to last a lot longer than rubber dome keyboards. Because each key uses its own mechanical switch, instead of a single rubber blanket. The durability of mechanical keyboards comes down to the materials. The switches are made completely out of metal. A typical mechanical keyboard can stand up to 50 million key presses or more, while a rubber dome keyboard is only good for 10 million. There are various differences between mechanical switches. Each switch is divided into its own color and has distinct design differences. Since there are too many mechanical switches to mention. We will only go over Cherry MX mechanical switches and the most popular ones. It is hard to explain how a mechanical switch feels, so WASD has a 6-key switch tester that may be useful for those who are undecided. Cherry MX Blue switches provide a tactile bump and an audible clicking sound. You can hear and feel when the activation point is hit. The actuation force is 50 cN. It is one of the loudest mechanical switch. Blue switches are good for marathon typing sessions. It can be beneficial to MOBA or MMO gamers, but may not be suitable for FPS gamers because of the loud audible clicks it produces. For a less noise intensive switch, try Brown or Red switches. Cherry MX Brown switches provide a tactile bump, but does not have an audible click. The actuation force is slightly less than blue switches, at 45 cN. The tactile point is less pronounced and is easier to feel when the key is pressed lightly. Cherry MX Brown switches are good for long typing sessions and is better for gaming than Cherry MX Blue switches. Because of the less intensive noise, it is good for MMOs, RTS, MOBAs, and even FPS games. Cherry MX Red is a linear switch, which means it has a similar feeling throughout each keystroke. It delivers a smooth response and has a wide actuation zone. Cherry MX Red switches are responsive and perfect for executing double or triple taps. Red switches are very light and most suitable for people who press keys in quick succession. It has no audible click and no tactile bump. Thus, it is one of the most silent mechanical switches. Cherry MX Green switches are both tactile and clicky. You can feel the bump and hear the click with each key press. The actuation force for green switches are 80 cN, making it one of the toughest mechanical switches. The keys are more noticeable than other switches. It is also one of the loudest mechanical switches relative to other Cherry MX switches. Cherry MX Clear switches are stiff and tactile, but is a non-clicky switch. Similar to Cherry MX Brown switches, it has a tactile bump before the activation point. At the tactile point, the actuation force is 65 cN. However, the resistance increases sharply at the bottom at 95 cN. The high resistance also means Cherry MX Clear switches have the most friction of all Cherry MX switches. Cherry MX Black switches are medium stiff and non-clicky mechanical switches. 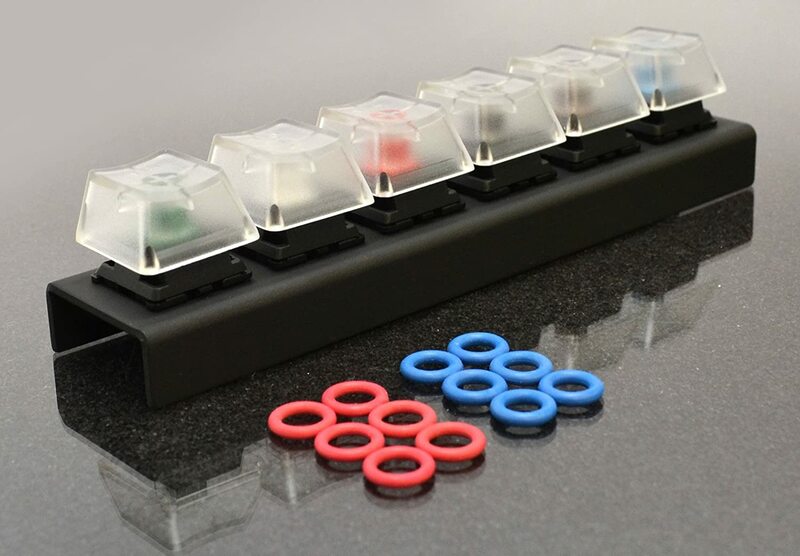 It is one of the very first mechanical keyboard switches to be available in the mass market. There have been various adjustments made to Cherry MX Black switches. Earlier generations feel smoother and less stiff compared to current variants. Cherry MX Black switches are a linear switch type, with an actuation force of 60 cN. The Das Keyboard 4 Professional is the best overall mechanical keyboard. It has widely been regarded as one of the best mechanical keyboards every built. The Das Keyboard 4 takes it to another level. It maximizes typing pleasure and tactile comfort that cannot be matched by other keyboards. Das Keyboard 4 has implemented slight improvements over its previous generations. The latest edition brought forth a refined look, a magnetic strip that acts as keyboard feet and doubles as a ruler, and dedicated media keys with a volume rocker for controlling music. 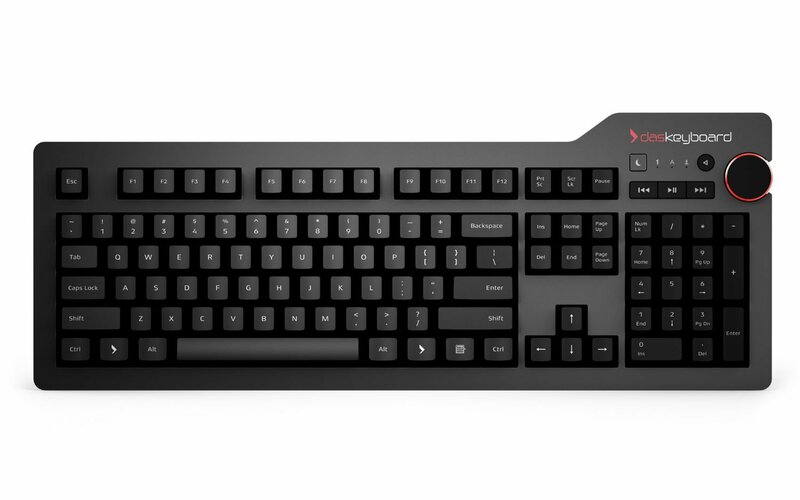 The Das Keyboard 4 Professional offers two different mechanical switches: Cherry MX Blue or Cherry MX Brown. The Blue switches provides a tactile feedback as well as a loud clicky sound. The sound does sound foreign at first, but it doesn’t take long to adjust to the sound. The Brown switches provide a tactile feedback, but does not have a sound feedback. For people who are more conscious about noise, the brown switches is a very good alternative. The Razer BlackWidow Chroma is the best mechanical gaming keyboard. It is one of the best selling gaming keyboards worldwide and is used by many professional gamers. The BlackWidow Chroma has been specifically designed with gamers in mind. It even has special mechanical switches designed just for gaming. The result is an incredible keyboard which focuses more on precision and speed. This elite mechanical gaming keyboard is better and faster than ever before. Every single key on the BlackWidow Chroma is fully programmable. There are five extra macro keys that is also fully programmable. And each key can be assigned its own backlit color with up to 16.8 million color options. The BlackWidow Chroma Clicky has a Cherry MX Green mechanical switch, which provides a tactile feel and audible feedback. The BlackWidow Stealth edition uses Cherry MX Orange mechanical switches, which offers a tactile feel without the audible sound. The CODE 104-Key Illuminated Mechanical Keyboard is a low profile keyboard. It is a beautiful keyboard with a simple and clean appearance. The keyboard has full white LED backlighting and seven levels of brightness. The white LED backlighting contributes to the idea that this keyboard has a minimal profile. A minimalistic keyboard is hard to find, especially if you want a mechanical keyboard that is full of features. The CODE 104-Key mechanical keyboard is specially designed to meet the criteria. The CODE keyboard is mounted to a steel backplate and is built to last for many years. Inside the CODE keyboard is the ultra-rare Cherry MX Clear mechanical switches. It has a quiet actuation force, non-click activation, and a tactile bump on every keystroke. The keys are meant to provide a solid typing experience without the sound interfering with your neighbors. For a more common mechanical switch, the CODE keyboard does have Cherry MX Brown switches. 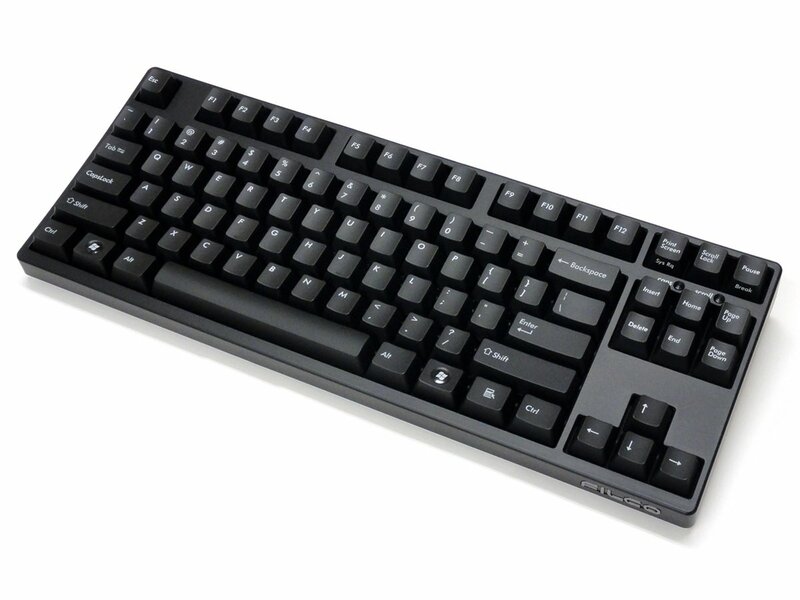 The Filco Majestouch-2 Tenkeyless is a basic mechanical keyboard. It doesn’t have a glossy finish, backlit keys, usb ports, or media keys. The aesthetics is simple and minimal but the Filco Majestouch-2 is a rather expensive keyboard. It is relatively expensive because it doesn’t have many features found on keyboards of the same price range. The Filco Majestouch-2 delivers amazing performance with a choice between Cherry MX Brown or Cherry MX Blue mechanical switches. Despite being a compact keyboard, the Filco Majestouch-2 has full-size keys. However it is missing the numberpad, hence the name tenkeyless. Without the numberpad, the keyboard is much more compact and with full-sized keys the Filco Majestouch-2 feels like a normal keyboard. A compact keyboard is very advantageous for travelers or people who need extra desk space. Mechanical keyboards are generally more expensive than regular rubber-dome keyboards. Even the most basic mechanical keyboards are over $100. 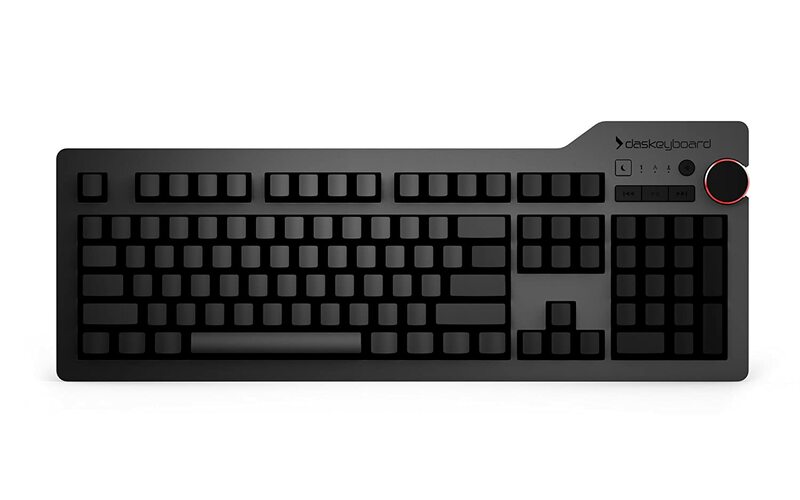 The CoolerMaster CM Storm QuickFire Rapid is a budget mechanical keyboard that is under $100. It is a simple and compact keyboard with a much lower pricepoint. The Filco Majestouch-2 is nearly double the price of the CM Storm QuickFire. Whereas the CM Storm is one of the cheapest mechanical keyboards on the market. 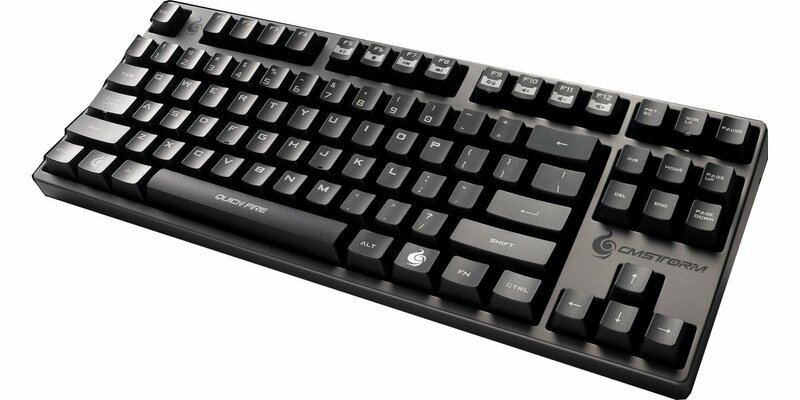 The CoolerMaster CM Storm QuickFire Rapid is a minimalistic mechanical keyboard with essential features. It is a premium quality keyboard that is durable and accurate. Typing is comfortable and there is a selection of mechanical key switches. There are Cherry MX Blue, Cherry MX Brown, or Cherry MX Red switches. Most mechanical keyboards are louder than regular rubber-dome keyboards. However, it largely depends on the type of mechanical switches inside the keyboard. For example, Cherry MX Blue switches are specially designed to produce an audible click. While the sound is intended to help improve typing accuracy and speed, it can sometimes be undesirable. The Corsair STRAFE RGB Silent has silent mechanical switches that do not produce an audible click. It is relatively silent when compared to other mechanical keyboards. 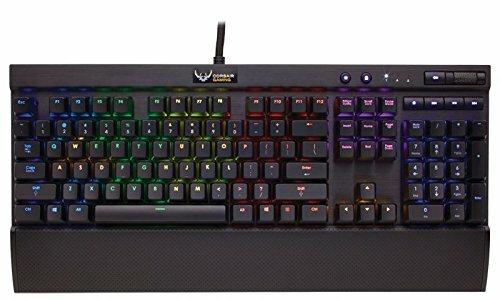 The Corsair STRAFE RGB Silent is the best silent mechanical keyboard because it is a full featured keyboard while other silent keyboards are not. It has fully programmable keys with individual assignments to each key. Similarly, mutlicolor backlighting is on a per key basis. There is built-in media control keys to easily adjust volume on the fly. USB ports are built into the keyboard for easy USB pass-through. The Cherry MX Red switches ensure a noise-free typing experience while also providing a fast and precise typing experience. The Corsair Vengeance K95 RGB is one of the best mechanical gaming keyboards. It has excellent build quality and beautiful multi-color backlighting. There are 18 G-Keys with up to 108 macros for an enhanced gaming experience. Macros can be assigned to any key and all keys are fully programmable. 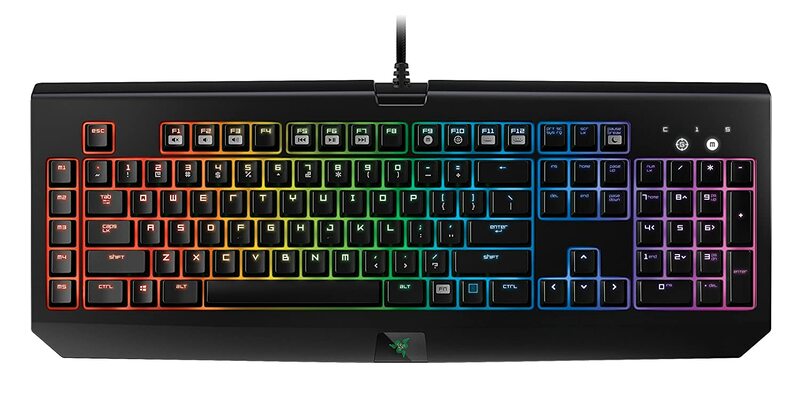 In addition, each key can be assigned its own backlighting with up to 16.8 million colors to choose from. And there are multiple brightness levels to guarantee a comfortable user experience. The additional keys make the Corsair Vengeance K95 unique. It provides a better gaming experience, especially for MMO or MOBA gamers. Aside from the impressive lighting and abundant keys, this keyboard is fully mechanical. All keys, including the 18 G-Keys, are mechanical switches. The Cherry MX Brown switches provide an actuation force, but does not have an audible click. Even though the K95 has many advantageous features, some of them may not be suitable. For instance, because of the 18 extra G-Keys, the keyboard is relatively large. For a smaller keyboard with similar features, there is the Corsair Vengeance K70 or K65. The Corsair Vengeance K70 RGB is extremely similar to the Corsair Vengeance K95. There is only one major difference, it doesn’t have the 18 extra macro keys. The keyboard is much smaller and is more preferable for people who do not need extra keys. Unless you actively play MMO or MOBA games, the additional keys are likely to be untouched. A smaller keyboard that takes up less space is much more favorable. The Corsair Vengeance K70 RGB shares much of the same features as the K95. It has an excellent build quality with multi-color backlighting. Each key can be individually programmed and distinctively colored. The underlying mechanical switches are Cherry MX Brown, which provides an accurate tactile feedback when pressed. It has media keys for easily adjusting music or volume controls. 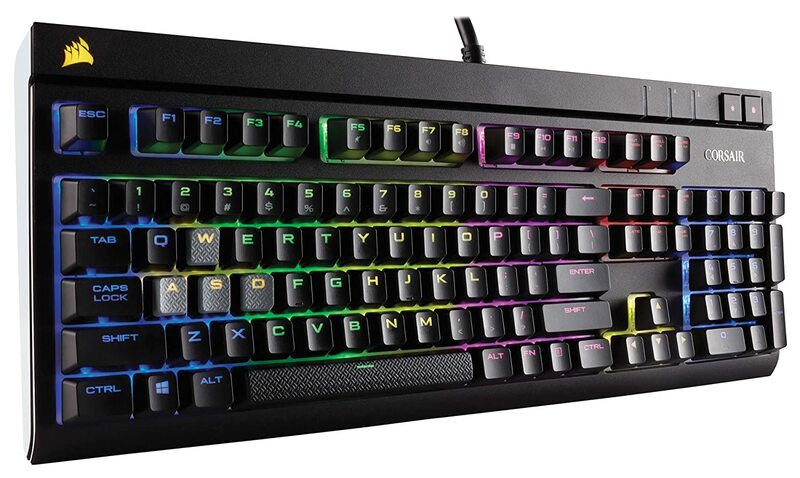 For an even smaller keyboard, try the Corsair Vengeance K65 RGB. It is identical to the K95 and K70, but it is missing the 18 G-Keys and the numberpad. The Das Keyboard 4 has already been featured in this article. The Ultimate version of this keyboard has the same features and functionalities as the Professional version, but with one exception. The Das Keyboard 4 Ultimate has no keycap engravings, it is completely blank. This is a great alternative for people who want a minimalist look and feel with a complete high performance keyboard. Similar to the Professional version, there are two different types of mechanical switches: Cherry MX Blue and Cherry MX Brown. The Blue switch makes a loud audible sound and provides a tactile feedback. The Brown switches do not make an audible click, but does have an tactile feel. The Logitech G910 Orion Spark is one of Logitech’s finest gaming keyboards. It combines many of the great features in Logitech’s gaming lineup to produce an ultimate gaming keyboard. The Orion Spark is the world’s fastest RGB mechanical gaming keyboard. The new Romer-G mechanical switches is approximately 25% faster actuation than normal keys. Customization on the G910 is superb with individual lighting and macro programming. Each key can have a choice between 16 million different colors. The individual keys are an addition to the Orion Spark’s greatness. 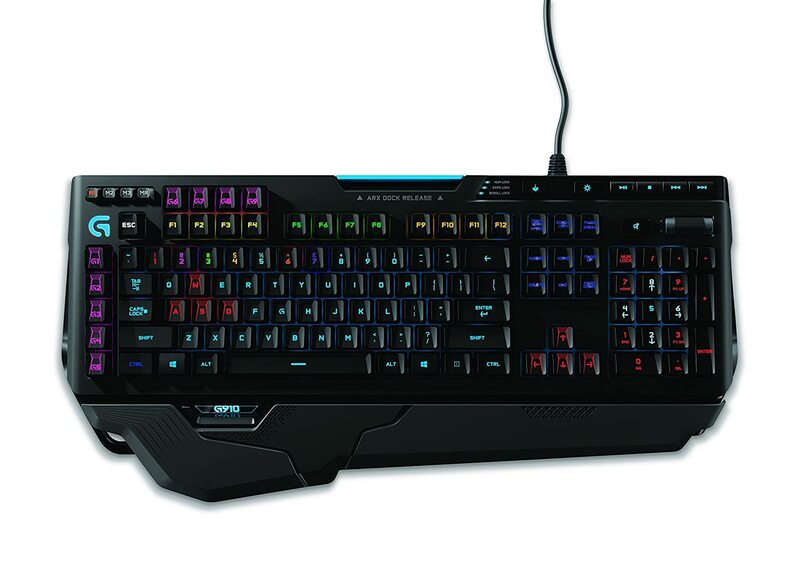 It has 9 programmable G-keys to provide the ultimate gaming experience for MMO gamers. The extra keys are sufficient and does not occupy too much additional space. In addition to programmable keys, there are media keys that make changing music while gaming very easy. Logitech G910 has a docking station for smartphones or tablets that can be used to display gaming data.